The document presents Richardson’s priorities with four “lines of effort” to strengthen naval power at and from the sea; achieve high velocity learning at every level; strengthen our Navy team for the future’ and expand and strengthen our network of partners. It isn’t an earth-shattering document, and perhaps is most telling for what it doesn’t say, as opposed to what is says. The document makes a strong case for forward presence, which has been the raison d’etre for the U.S. Navy for decades. After three surface warriors in the CNO position (Admirals Vern Clark, Mike Mullen and Gary Roughead), the Navy is now led by the second consecutive submariner. Both Richardson and his predecessor, Adm. Jonathan Greenert, have made the Ohio Replacement Program (ORP) their top priority. ORP will replace the 16 active Ohio-class nuclear-powered ballistic missile submarines (SSBNs) with a new class of 12 submarines, all designed to keep the U.S. within strategic weapons treaty limits for launchers and warheads. The SSBNs are part of the nation’s nuclear triad, which also includes land-based bombers and fixed missile silos. The ORP bill is expected to far exceed the Navy’s normal shipbuilding budget, so some financial finagling will be required to have some kind of separate budget category. It might seem that with such an expensive proposition, it might make sense to phase out the air and land based delivery systems, and put all the strategic weapons in the SSBN basket, as the submarines are the most survivable leg of the triad. The first replacement sub could enter service in 2021, but the program needs to get started now. In the meantime, the land-based ICBMs must be modernized, and the Air Force’s long-range strategic bomber program has commenced, also a costly programs. And it may surprise you that some submariners argue against relying solely on the SSBNs. If the fleet of SSBNs were the sole delivery system of America’s nuclear arsenal, then a potential adversary would dedicate enormous resources to counter it. With the triad, there is no single point of failure, and an enemy’s problem is much more complicated. The problem of paying for the strategic capability may come at the expense of conventional platforms. Even the sacrosanct aircraft carrier could be a budget casualty. Defense Secretary Ash Carter’s recently notified the Navy that it needed to cut back its plans to acquire LCS from 52 ships to 40. Such a move would seriously disrupt the shipbuilding plan, and reduce ships that are sorely needed to maintain forward presence, not to mention are uniquely capable of dealing with the asymmetric threats of mines, submarines and swarms of armed surface craft in the littoral. “The Navy’s strategic future requires more on focusing on posture, not only on presence, and more on new capabilities, not only on new ship numbers,” Carter said in a letter to Navy Secretary Ray Mabus. There is a balance between capability and capacity. Even the most capable warship can be everywhere all the time. LCS would be the platform most probably on station to provide visible presence around the world. “Even as these challenges become more complex, the character of the game accelerates forward and becomes faster and more challenging, as the competitors also become more numerous and more challenging,” said Richardson, speaking at the Surface Navy Association’s annual symposium in January. The challenge of anti-ship missiles in and around the world’s choke points has been compounded as new weapons are introduced, that are faster, have longer range, and may be more destructive, Richardson said. The SNA symposium theme was “The Surface Warfare Strategy: A view beyond the horizon.” Vice Adm. Tom Rowden’s concept of “distributed lethality” to “increase the combat capability of naval surface forces,” makes sense. “It’s holding more adversaries at risk across a wider geography.” Rowden said. LCS has been mocked—unfairly—for its lack of combat power. The derision is based on the argument that LCS doesn’t have the firepower or survivability of a destroyer or frigate—and those critics would be correct on that account. However, that’s not what LCS was designed for. The U.S. navy has no peer when it comes to open ocean “blue water” naval combat. The carrier strike group (CSG), with surface escorts and dedicated attack submarines, is the most potent combination of naval power afloat. If an enemy has the means to get out into the blue water to challenge the CSG, it will not prevail. But all-out war in the middle of the ocean is a less likely scenario than regional conflicts, threats to commerce, and asymmetric threats in coastal waters or choke points. A number of nations have quiet diesel submarines or mines that can challenge combatants and threaten merchant shipping. And even a small, fast armed boat can be a menace, especially if there are enough of them—death from a thousand cuts. These asymmetric threats are real, and can be employed by even the smallest nations, or worse, non-state actors. And compared to the middle of the ocean, the littoral waters of the world are complex environments with varying types of geography, bottom types, currents, temperatures, salinity. It’s where the people live, and where commerce moves … and close enough to shore where adversaries of all types can get to. If the challenge is to effectively deal with these asymmetric threats in littoral environments, specialized systems need to be used that can detect, track and destroy them if necessary. Dedicating high-value capital ships—which excel in the blue water—is a waste of their capability, and they would be ill-suited for the mission. However, offboard systems could be employed where the host platform could remain outside the highest threat area and deploy manned or unmanned aircraft, surface vehicles or undersea vehicles to deal with those asymmetric threats of subs, mines, and surface craft. The capability would be reside in mission packages that could be changed based upon the threat. That’s the LCS concept. 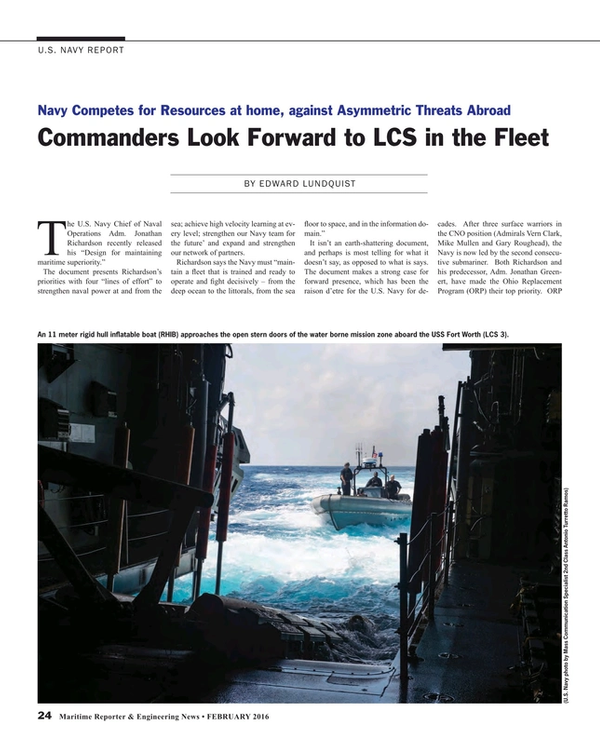 LCS wouldn’t be alone and unprotected. It has a core capability for self-defense regardless of what mission package it carries, and, when appropriate, would be defended by larger combatants with their more robust multi-mission combat capability. If you had to develop up with a platform for these off-board systems, the result would be a ship with lots of volume to carry and operate the off-board systems, self-defense capabilities, and speed to get in and out of the threat area for launch and recovery. It should be relatively small, so you can build and operate a lot of them, so they can be present where needed. The LCS image problem may be the result of the idea that putting together these mission packages into boxes and getting them to sea wouldn’t be such a big deal. But it’s taken more than a decade and the mine countermeasures and anti-submarine packages are still not ready for prime time. The only mission package that truly exists at present is the surface warfare package, a vastly simpler combination of surface and air assets, without the complexities of working underwater. With the crowded field of presidential candidate wanting to criticize the administration, it has become fashionable to call for a bigger, stronger force, and more ships. These candidates are also calling for a reduction in federal spending, but they don’t talk about how to pay for a massive defense buildup. “At the beginning of Fort Worth’s 16-month rotational deployment, she left San Diego for Hawaii, then to Guam and into Jakarta, Indonesia, before sailing to Singapore. She arrived here the day after the Air Asia flight went down in the Java Sea. She had a long-planned maintenance period already in place. But for quite obvious reasons, we delayed that maintenance and turned Fort Worth around, than placed a mobile dive and salvage unit and capability on board Fort Worth, and she got underway and headed straight to the Java Sea, and in less than 24 hours was reporting for duty, and ready to conduct search and rescue operations. It’s a great example of the reliability, because we were able to delay that maintenance until she came back almost two weeks later. Williams is thinking ahead to 2018, when four LCS ships that are slated to be rotationally deployed to Singapore. OPTECH East was presented by the Naval Postgraduate School’s Littoral Operation Center, along with the Office of Naval Research Global and the Japanese Maritime Self-Defense Force and the Swedish company Saab Electronic Defense Systems. So that’s what Maritime Reporter’s naval affairs editor, retired Navy Captain Ned Lundquist, will try to do in our new quarterly column discussing military ship spending & trends.